The Dubai Water Canal changed the face of Dubai and made history as one of the biggest urban transformation in the world. This canal is 3.2km long waterway. Ducorr deployed the Cathodic protection materials, designed, installed and commissioned for the Marsa Al Seef Marine site project. The proposed development is spread over approximately 1.80km along the Creek and includes generally hotel, retail, marina, underground car park, canal, etc. It covers marine infrastructure and environmental design elements. Ducorr has been the preferred vendor for the design & deployment of cathodic protection for the Aqaba New Port. Ducorr was retained to carry out the detailed design and supply of the cathodic protection system for a combi-wall structure that eventually made up four marine berths. The port configuration consisted of four berths, complete with dry dock facility. Ducorr has completed the deployment of corrosion protection systems at an ADNOC project in Ras Al Khaimah. The system provides corrosion protection for up to 30 years. Platepro system was also used in this project, adding that it was installed in less than three hours which represents an estimated 150% time savings compared to standard systems. Ducorr was contracted to design and deploy a Cathodic Protection System for Shell Iraq Petroleum Development (SIPD) to protect its new and existing buried flowlines in Majnoon Oil Field,Iraq. The Majnoon Oil field being development by SIPD has several existing and new buried flowlines and production facilities. These flowlines are buried in very corrosive soil and therefore require protection. As the commissioning of a permanent cathodic protection (ICCP) will require more than 6 months, a temporary protection of the new flowlines was needed in order to provide protection during this period of time. The world's largest aluminum smelting plant chose Ducorr for the complete design and deployment of cathodic protection for its underground fuel and water cooling pipelines as well as the cathodic protection of its storage tanks. The systems involved a temporary cathodic protection system for the pipelines, followed by a distributed discrete impressed current system once permanent power was made available. In addition, impressed current cathodic protection was deployed for the internal surfaces of the water tanks. The existing import/export terminal of the port Khor Al Zubari positioned at the extreme south of Iraq was constructed in the mid 80s. 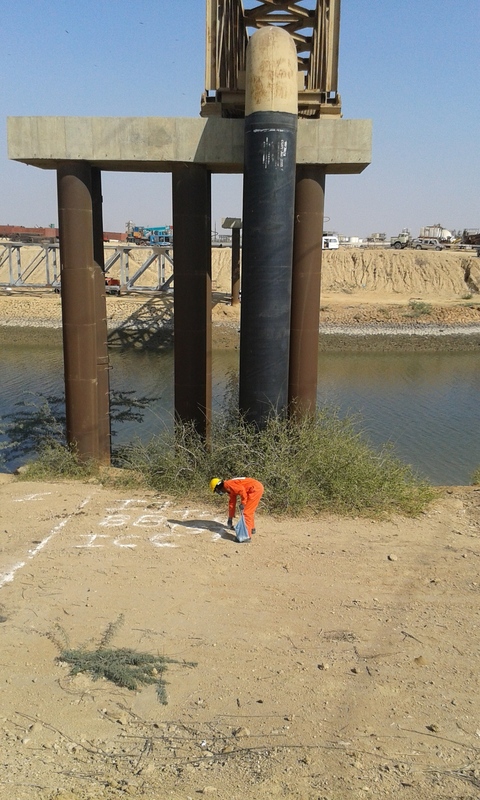 The rehabilitation program undertaken by the Ministry of Port involved the application of protective coating, followed by the implementation of a cathodic protection system for the steel tubular piles. The system covered the protection of four wharfs. The LNG development taking in the port city of Karachi involved the laying of gas pipelines that shall be tied into the main gas network. Ducorr was retained for the review of the detailed design, followed by the supply of all cathodic protection equipment and the supply of specialist monolithic isolating joints. The project covered the ICCP of two coated high gas pressure gas pipelines approaching 50km in length. At one time known as the worlds largest construction site, the Pearl GTL project also included the construction of a number of above ground storage tanks. Ducorr was responsible for the plant wide cathodic protection of all storage tanks. The project was designed & deployed on time & on budget. The system consisted of ICCP of over thirty above ground storage tanks, fire water piping and corrosion monitoring of heated tanks. The Dubai International Airport has grown to be one of the worlds busiest airports. As part of the durability monitoring of the concrete structure, Ducorr was retained design and install a corrosion monitoring system for the reinforced concrete. The system was installed in select areas of the buried reinforced concrete foundation and shall serve to give an early warning of any early onset of corrosion. The State of Qatar is one of the worlds largest gas producers. As part of its strategic development, the construction of LPG tanks to store large quantities of propane & butane formed the back bone of the Al Khaleej gas project. Ducorr carried out the detailed design & supply of the impressed current system for the reinforced concrete foundation raft & associated piles. Anantara Doha Island Resort is an uninhabited offshore island situated approximately 31/2 Kilometers from new Doha International Airport (closest main land point) and 11 Kilometers east of Doha City. The project involves the construction, development and operation of a 5-Star island resort property.The island resort incorporates the use of tubular steel piles that support various structures such as villas or walkways. The steel tubular piles suffered premature severe corrosion a shortly after installation. DUCORR has been retained to propose a durability solution using cathodic protection.